The Mtech Biotechnology Research and Education Program (BREP) hosted 27 industry professionals on campus for its annual Biomanufacturing Workshops series from June 11-19. The series consisted of four individual workshops covering the biotechnology principles of upstream and downstream bioprocesses, including Cell Culture Technologies, Fermentation Microbiology, Downstream Processing and Protein Purification, and Analytical Sciences. The first five days of workshops took place at BREP’s Bioprocess Scale-Up Facility from June 11-15, at the University of Maryland. The final workshop in the series, Analytical Sciences Training, took place at the National Institute of Standards and Technology (NIST) in Rockville, Md., from June 18-19. 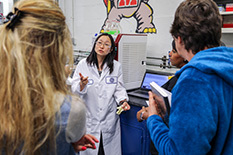 Biotechnology professionals attended from the National Institutes of Health (NIH), Food and Drug Administration (FDA), Certis USA, Agilent Technologies, Emergent BioSolutions, and Montgomery College, as well as a recent UMD alumnus. During the workshops, attendees received in-class lectures to explain processes, followed by hands-on lab time where they applied the information learned during lectures. Following the completion of their workshop, attendees receive a certificate and 2-3 continuing education credits, depending on the workshop attended. In addition to these workshops, BREP also offers customized training in many aspects of bioprocessing, available year-round for Maryland biotechnology companies.